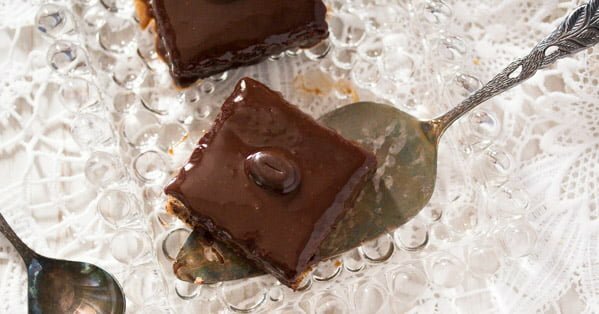 A simple chocolate hazelnut sheet cake, covered with a luscious and easy to make chocolate glaze. This cake keeps well for at least two weeks. Although so easy to make, this hazelnut chocolate cake is really a treat! I mean, think about it! Double chocolate (in the cake itself and on top of it as well) and lots and lots of hazelnuts. You will just love it! 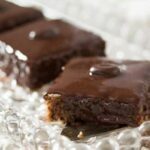 This sheet cake recipe makes quite a large batch, but trust me, there was not a piece left by the end of the day. We had some guests and I had actually baked two cakes for the occasion… I could not believe it that all of this hazelnut cake was gone so fast. I do love hazelnuts and use them very often in my baking. Wonderful hazelnut cakes like this Hazelnut Chocolate Banana Cake, these Crispy Chocolate Squares with Caramel and Hazelnuts or these German Hazelnut Macaroons. Making this decadent chocolate sheet cake with hazelnuts is really a simple affair. First of all, as always when using chocolate in such large quantities, make sure you buy good quality chocolate. 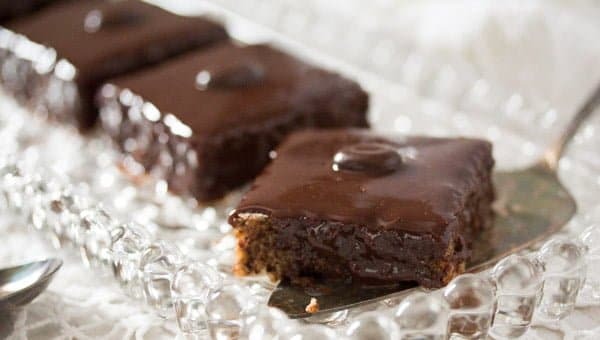 In this case, you will need dark chocolate with about 70% cocoa, a bit more or less is OK, but don’t use milk chocolate or anything less than 60% cocoa. Before you start stirring the batter, you will have to grate the chocolate. You can easily do that in the food processor. In this case, chop the chocolate into small pieces and grind them in the food processor. This will happen quickly, so don’t overdo it or the chocolate will start to melt. To make the batter, mix together the dried ingredients: flour, hazelnuts, grated chocolate, cardamom (if using) and salt. Set aside. In another large bowl, beat the eggs, sugar and soft butter together until nice and fluffy. Add the dried ingredients and incorporate. Pour this mixture onto a baking tray lined with baking paper and bake the chocolate hazelnut cake in a preheated oven for 25 minutes. 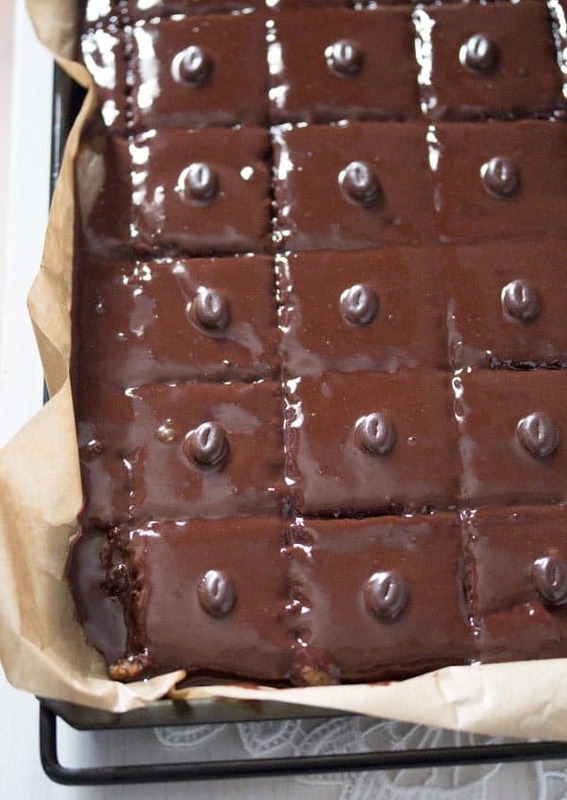 Leave the cake to rest for about 15 minutes, cut it into squares but leave the squares on the tray. Let the cake cool completely on the tray. 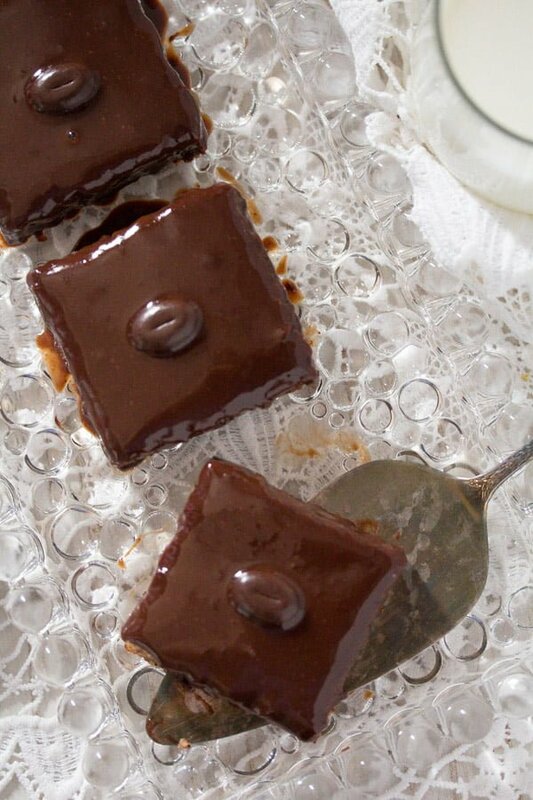 When cooled pour the chocolate glaze over the hazelnut chocolate cake and decorate each square with a whole roasted hazelnut or chocolate decoration of choice. Keep the chocolate hazelnut cake pieces airtight in a cool place (not necessarily refrigerated, a cold cellar would do). They will keep for at about 2 weeks. 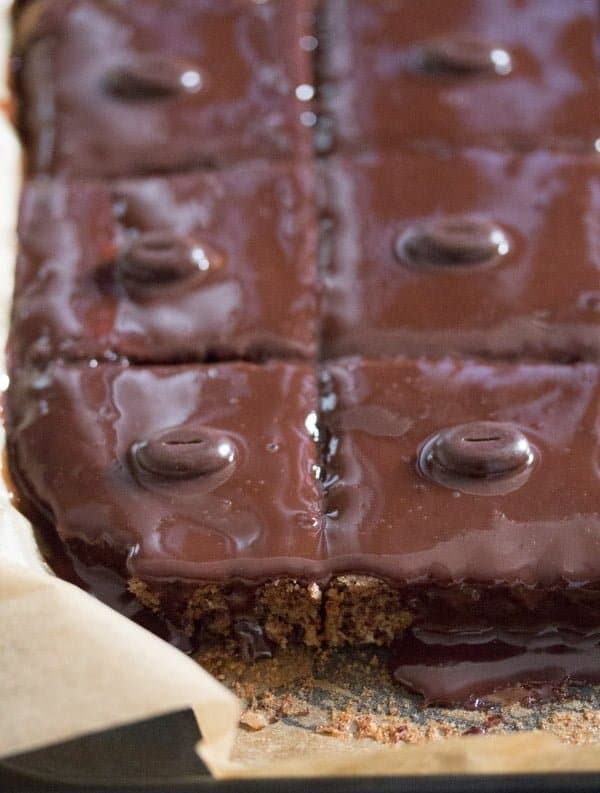 To make this amazing chocolate glaze, you will only need a few ingredients. As mentioned above make sure to use good quality chocolate, only something that you enjoy eating as it is as well. You could use semisweet chocolate chips for convenience and if you really like their taste. But usually, I prefer buying good quality chocolate and chopping that, it makes a bit more work and it costs a bit more as well, but it just tastes better. And when making a glaze using so much chocolate, it makes no sense for me to use the chocolate chips, which are perfectly fine when hidden in a nice chocolate chip muffin or cookie, but which will stand out so much and rather negatively when used in large quantities. To make the glaze, start by heating the heavy whipping cream in a small saucepan, it should start to simmer lightly before you add the rest of the ingredients. When simmering, take it off the heat and stir in the chopped chocolate, sugar and cubed butter. Stir well until the chocolate is completely melted and the glaze is shiny. Carefully pour the glaze all over the cake and let it set for about an hour or longer. The glaze will not become completely solid, it will set but it will remain soft. 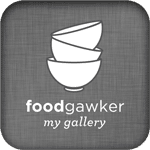 And in case, you have some leftover chocolate glaze, you can pour that on top of ice cream or waffles, for instance, as a kind of chocolate sauce. 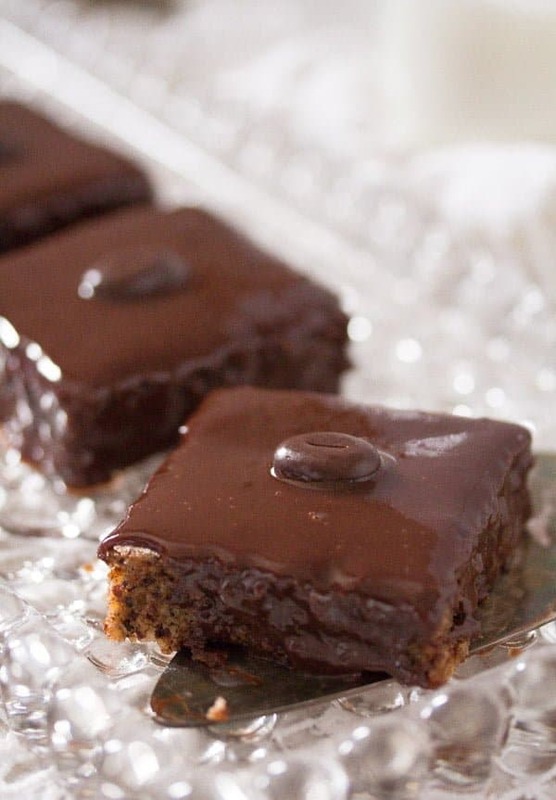 The chocolate glaze keeps well for 3 -4 days in the fridge and it can be frozen for a while as well. Chop the chocolate. Give the pieces to a food processor and grind finely. Don't overdo it or the chocolate will start to melt. Alternatively, you can grate the chocolate on a regular grater. Give the eggs, sugar and soft butter to a bowl. Mix until fluffy. In another bowl, mix together the flour, hazelnuts, grated dark chocolate, ground cardamom (if using) and a pinch of salt. Give the mixture to the egg and butter mixture and incorporate. 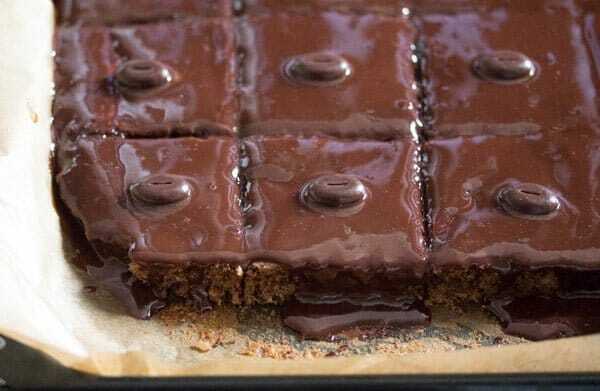 Pour the batter onto the prepared baking sheet and smooth the surface. 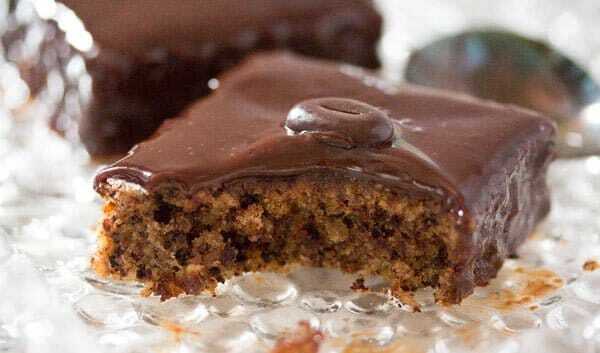 Bake the hazelnut cake for 25 minutes. Leave to rest for about 15 minutes, then cut it into pieces. Leave to cool completely onto the baking tray. Pour the double cream into a small saucepan. Bring to a light simmer. Remove from the heat and stir in the chopped semisweet chocolate, sugar and cubed butter. Stir well until the chocolate is completely melted. Slowly, pour the chocolate glaze over the cake. Decorate the cake pieces with whole roasted hazelnuts or chocolate decoration of choice. Note: The cardamom can be left out or replaced with cinnamon. I love the classic combo of chocolate and hazelnut…the cake looks wonderful!